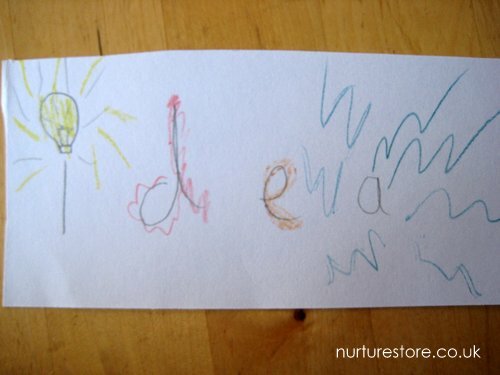 When I think back to the ways I learnt how to spell as a child, there was no fun or creative play involved. We got list of ten words every week, we copied them, we copied them, we copied them again, and then we had a test on a Friday to see how well we could remember them. We also had to put our hands up to show the whole class our scores, so if you hadn’t remembered that many it was pretty miserable. But learning how to spell doesn’t have to be like that. Here are ten ways we learn spellings in our house – with lots of creativity and fun and jumping around involved. 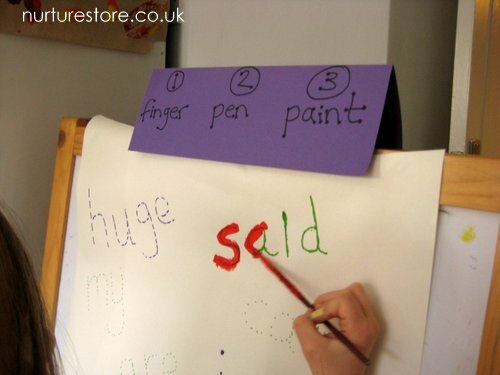 There are lots of different ways that children learn and these spelling activities cover a range of preferred learning styles: visual/spacial, auditory, kinesthetic… If your child has a very strong learning preference trying out these ideas might help you discover a way that’s just right for them (it’s helped enormously in our house). In any case, all children can benefit from learning through a variety of ways, using all their senses, mixing things up a little so it doesn’t get boring, and maybe even enjoying learning how to spell. The activities may take a few minutes longer to set up then just grabbing a pencil and paper but we’ve found they are a whole lot more fun – and effective – than just copying out the words. 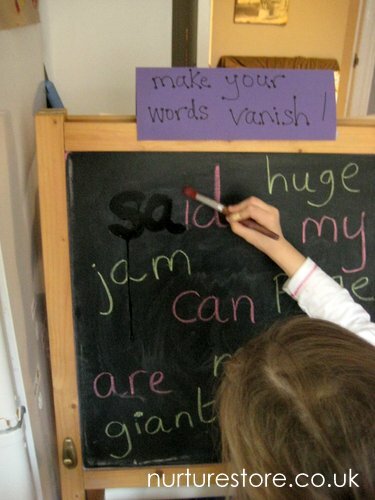 Write out the spelling words on a chalkboard and then paint them away with a paint brush and water. This helps children follow the shape of the letters and learn them in sequence. Write out the words in large letters on a sheet of paper. Trace them out with your finger, then draw over them with a pen, then paint over them. We find having an enticing choice of colourful pens and paints makes all the difference! Write out a really big alphabet of letters. Say your spelling word and then splat the letters, in order, with your hands or jump from letter to letter. Great for action kids! And if you stand in the centre of the alphabet and use both hands to splat your letters you get to practise crossing the mid-line, giving you an extra brain boost. You don’t have to only learn how to spell indoors of course. 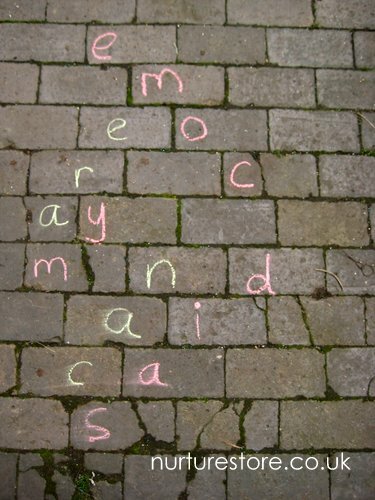 Write out your words in chalk in the garden and hop, skip or jump along your word ladders, saying the letters out loud as you go. Sounding out the letters adds in an extra sense and brain function to all the activities. You’re not allowed to walk through our playroom any longer – you have to spell (or times table) your way. 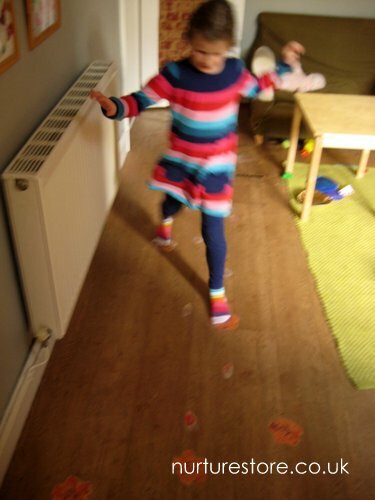 Make some words, letters (or numbers) to stick to the floor and learn as you jump. 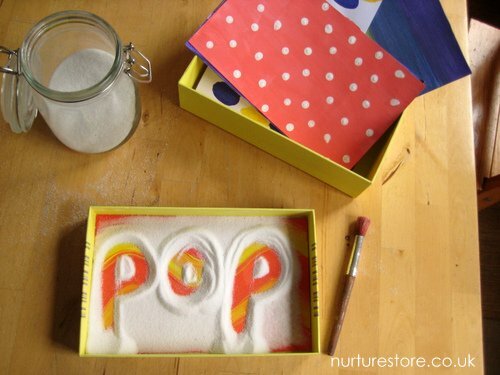 Fill a shallow box or tray with salt or sand and draw out your words with your finger or a paint brush. Taking the spellings away from a pencil and paper can be much more appealing to children, and you’re adding in an extra sensory dimension by using the touchy-feely salt. 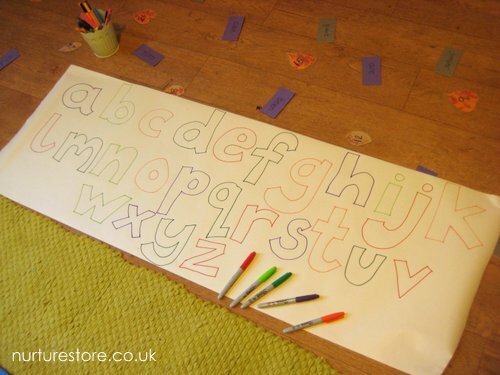 Making some colourful backgrounds to lay under the salt gives you a nice surprise to reveal with your letters. 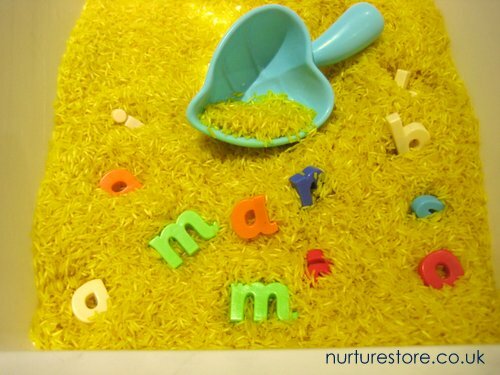 Take a sensory tub and hide some letters inside -we use our zingy lemon scented sensory tub with fridge magnet letters. 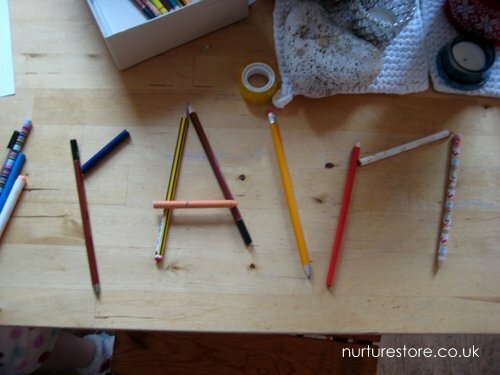 You don’t have to write your words on paper to practise how to spell them. Building them out of pencils or pipe cleaners is a great way for visual/spacial learners to practise. Another great idea that works for visual/spacial learners is to draw out the word as a picture, rather than a linear sequence of letters. Ask your creative kid to think what the word suggests to them and have them add colours and pictures to turn the spelling into a work of art. Encourage them to see and think of the spelling word as a whole picture – just as they might recall what Van Gough’s Sunflowers looks like – and store that image in their brain, to recall when they need to write the word down. Did you think I could leave out our beloved play dough? Dough is a great sensory material and so pliable that it’s a great medium to use to learn spellings. These are all fabulous! I especially like Make Your Words Vanish. So simple but so effective! I have alphabet stamps that I have kids stamp into playdough. Great fine motor practice along with spelling reinforcement. Love these! Pinning for future use! So many great ideas. R is what you’d called a “kinetic learner” (read “can’t sit still!) so the hop scotch activity will be perfect for him. That was great in our kinder we use some of these tips, we also use written words with fluo marker,kids write with more security,we use dough,they write on others shoulders,they walk letters and numbers,thank you for your ideas! Thank you for the extra ideas ale. I love the idea to write on each others shoulders. 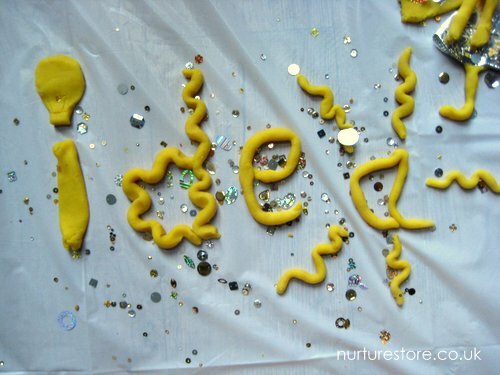 Another way to use play dough is to buy alphabet cookie cutters and use them to impress the words in playdough. I also like using alphabet stamps.